Tours of all three New Melle fire stations are available by advance request. Such tours are quite popular with school groups, scouting organizations, etc. 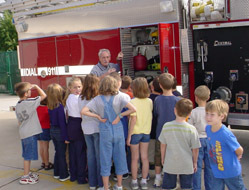 Fire truck and equipment displays or demonstrations can also be arranged with advance notice.